I glanced at him, and felt like the air had been sucked out of me. His profile was straight and chiseled. Dark brown hair curled slightly over the collar of his long, cape-like coat. A line from Otherworld came to mind: He would have been classically handsome were it not for the forbidding expression on his face. I gave my head a shake. After all I’d just been through, I was still thinking of Alexander Banks. It must have been a mirage—my mind’s way of bringing me comfort after the terror. 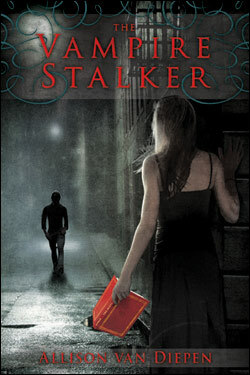 "The Vampire Stalker is smart, compelling, and touched with a cleverness that makes it a must-read. The characters are well drawn, the situations unique, and the stakes high – everything one could possibly want in a YA vampire novel." "Allison Van Diepen has written a novel which will please both avid readers and reluctant readers... Please, Allison, don't keep your fans waiting too long for the next novel!" "WOW! I LOVED this book! And after reading The Vampire Stalker, I wouldn't mind Alexander Banks coming to life." "The Vampire Stalker is a book for book lovers. You'll become immersed in the story within pages, because it's like reading about you and your friends. Well, at least if you and you're friends are as book-crazed as me and mine are!" "Great characters and an overall fun and unique story." There was a festive vibe in the air that reminded me of the fourth of July. Except I didn’t get this excited on the fourth of July. Today was the day I had waited a whole year for. I was finally going to get my hands on a copy of The Mists of Otherworld, a book so hotly anticipated there’d been a whole news segment about it on TV last night. I stood in the line outside the Book Nook with my best friends, Luisa and Katie. We’d been there since 7:45 am—brutal for a Saturday morning, but worth it— wanting to get a good spot in line before the store opened at 9. The atmosphere was electric. Besides dozens of teenage girls, there were women in their twenties, moms with strollers, even a few grandmas, and a handful of teenage guys. Luisa stepped away from the line and glanced ahead. “I wish they’d let us in already!” she sighed, stumbling a little and grabbing Katie’s arm for support. , Believing that her shortness was a curse, Luisa insisted on wearing the highest wedges Payless had to offer. The result was that she rolled an ankle at least once a month. “I just hope they don’t sell out before we get to the front,” I said. “Yeah, but I heard on the news last night that some of the shipments were delayed,” I replied, feeling nervous as I spoke the words. The idea that I would have to wait another day to read about Alexander Banks—the gorgeous, fearless vampire stalker—was too awful to contemplate. “I am getting a book today, even if I have to body check someone to get it,” Katie announced. We laughed, because Katie would never hurt a fly—literally. When I’d visited her at the camp where she worked over the summer, she’d ushered even the smallest bugs out the cabin door. However, she was five foot ten and the captain of the girls’ ice hockey team, so a body check or two wasn’t out of the question. “All I know is, we have to read it by Monday morning,” I said. Katie and Luisa nodded. If we didn’t finish it by then, we’d have to cover our ears in the spoiler-filled hallways of our school. There had only been one book so far— Otherworld—in the author Elizabeth Howard’s planned trilogy, but it was a sensation and most people we knew had been sucked in. I felt the cool breeze on my face, and looked around at the swaying trees, appreciating the crisp, autumn weather. Some would say it was a waste of a beautiful day, because I planned to spend it inside reading The Mists of Otherworld. But sometimes it was nice to read on a lovely day, especially when the world inside the book was so dark and gloomy. One of the coolest things about the series was that it was set in my city, Chicago. But Otherworld Chicago was very different from the Chicago I knew. It was a place where mortals stayed in their homes after nightfall. A place where you didn’t trust anyone who wasn’t your kin. And it was all because of vampires. As the series told it, for centuries, vampires had existed in isolation in northern Scandinavia, preying on the residents of remote villages. Then in the 1920s, the vampires had decided to leave seclusion and migrate all over the world, creating more vampires as they went along. Otherworld Chicago had been hit especially hard because one of the world’s most notorious vampires, Vigo Skaar, had moved there with his coven of several hundred vampires. Vigo, and his vicious second in command, Leander, had been terrorizing the city ever since. As a result, innovation had stopped completely, and Otherworld had not made any technological advancements since the 1920s. The line surged forward, a sign that the store was opening its doors, and there was a chorus of squeals and some jostling. “How dare you, Katherine? And you think yourself worthy of James!” Luisa made a show of hoisting her chin and turning her back on Katie. 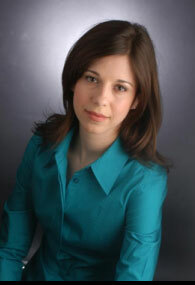 A self-professed drama geek, she loved using Otherworld’s formal language. While my Otherworld crush—well, more like obsession—was Alexander Banks, Katie and Luisa loved James, Alexander’s golden-haired cousin. Alexander was dark and brooding, and determined to hunt down Vigo, who had murdered his family when Alexander was only six. Meanwhile, James was a philosopher who wanted to bring peace to the Otherworld. James was in love with Hannah Skaar, Vigo’s sister, a vampire whose beauty and feistiness were only matched by her undying love for James. James was nice to read about, but he was no Alexander. I preferred a guy with some grit. Just the mention of Vigo gave me chills. There was no doubt in my mind that Alexander would kill Vigo. It was a question of when, not if. Finally, it was our turn. As we stepped over the threshold into the Book Nook, Luisa, Katie, and I clasped hands. I couldn’t help but think of how lucky I was that my friends shared my passion for Otherworld. It was actually our love of books that had first brought us together, in the ninth grade. Katie had started a high school book club and Luisa and I had been the only ones to show up. I’d just moved to the east side of Chicago after my parents’ divorce and didn’t know anyone. Within weeks, we’d become a trio of awesomeness, as Katie put it. Most people we met thought we’d been best friends forever, not just for a couple of years. Thankfully, the three copies I had preordered were there, waiting for us. I picked up my book, hugging it to my chest like a long-lost friend. It was extremely thick, longer even than the first, and that made my heart pound: the more of Alexander to read about, the better. Katie and Luisa were busy exclaiming over the cover—it had been revealed online months ago, but it was still amazing to see it up close and for real. The three of us left the store, breathless with triumph. There was no talk of hanging out afterward. We caught the bus and grabbed seats, reading the whole way. When I got to my stop, I reluctantly tucked the book under my arm (since I hadn’t mastered reading and walking like Katie had), and waved goodbye to my friends. My building was called Courtyard Place, a name that made it seem posh when it was anything but. I wouldn’t have any complaints about where we lived if it weren’t for the fact that my dad and his girlfriend—the one he’d left Mom for—had managed to buy a bungalow in the suburbs. If he could afford to live in a house, why couldn’t we? I pushed those thoughts away, determined not to stew in bitterness. Besides, nothing could shake my good mood today. I had a date with Alexander Banks, after all. I had to remind myself of that when I got inside the apartment and saw my younger sister, Chrissy, and her best friend, Madison, in the living room. Chrissy grunted and Madison said, “Hello there.” Madison had a way of talking down to people that made me clench my teeth. “Hope you got your vampire book,” Chrissy said, and I caught the isn’t she pathetic? glance she and Madison exchanged. Madison and Chrissy were often mistaken for sisters because they used the same blond hair dye. They were in eighth grade, but probably looked older than me, and I was a junior. On any given day they dressed like they’d just walked out of a dance club with their skintight camis, low-slung jeans and heavy makeup. If you looked closer, though, Chrissy and I did look like sisters. We were both fair-skinned and green-eyed, with slightly upturned “snob” noses, as Madison had once pointed out. She’d also pointed out, right in front of me, that Chrissy and I were like Before and After makeover pictures. I didn’t have to ask which one I was. My long, straight hair was the same mousy brown as Chrissy’s roots and I didn’t wear makeup most of the time— both capital crimes, in Madison’s eyes. I grabbed a Coke from the fridge and a crumpled bag of trail mix and went to my room. Kicking off my shoes, I sat back against the pillows, ready to lose myself in The Mists of Otherworld. Hands tingling with anticipation, I opened the book.